This contemporary rocker brings the classic rocking chair into the 21st century. Working well in a bedroom, living room, or foyer, the sharp clean lines and overall smooth appeal brings a sophisticated style to any room in the house. The sturdy hardwood frame supports the upholstered seat and back cushioning that both contribute to a comfortable sitting experience. Effortlessly sway back and forth just like how grandma used to, but do it with some updated convenience and contemporary class with this impressive rocking chair. 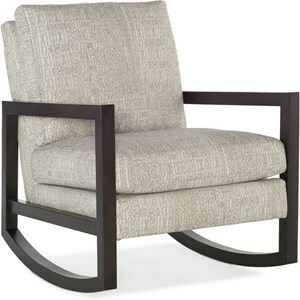 The Rocky Contemporary Upholstered Rocking Chair by Sam Moore at Howell Furniture in the Beaumont, Port Arthur, Lake Charles, Texas, Louisiana area. Product availability may vary. Contact us for the most current availability on this product.